These days, many people make a conscious effort to eat healthily. 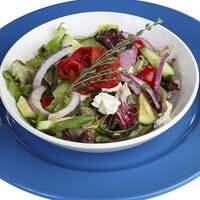 And what else epitomises healthy eating than a side plate of freshly picked salad? If you are keen to incorporate salad into your healthy living regime, or simply want to have a go at growing your own food, then the good news is that salad is one of the easiest plants to grow. There are also many different varieties of salad to choose from - whether you prefer light, mild crunchy lettuces or peppery and more bitter leaves, the chances are that there's a salad out there to suit your tastes. But even if you live in the smallest of bedsits, all you need is a windowsill and a little space put aside. Salad seeds grow very well in containers, and will thrive as long as they're reasonably well looked after. This means providing the growing conditions - light, regular watering and good quality compost are pretty much all that is required. The easiest and most space-saving way to grow salads is to make a window salad box. That way the salads are in easy picking distance - and food miles become food metres for unbeatable freshness! There are a plethora of lettuces and salad mixes available to buy. You could either plump to buy some ready-grown salad leaves in containers from your local garden centre, or sow your own salad mix. An oriental salad may contain any of the following salad leaves - Pak Choi, Chinese Cabbage (Tatsoi or Wong Bok) Purple Choy Sum, Komatsuma, Mustard Greens and Mibuna. A French salad mix will often include Mediterranean salad leaves and herbs that are also popular in Italy. They might include Chervil, Red Batavian, Sugary Loaf Chicory and Salad Rocket. Similar to French salads, and may include Salad Rocket, Oak Leaf Lettuce, Italian Red Dandelion and Broccoli Raab and other herbs. These salads need to be able to withstand high temperatures without wilting too much. Any cabbages included in salad mixes should be picked when young (baby leaves). Stir fry salad mixes may include Chinese Cabbage (Tatsoi), Savoy Cabbage, White Pak Choi, Chinese Kale, Choy Sum Yukina, Spring Raab, and Hon Tsai Tai amongst others. There are many herbs and salad leaves that have a distinctly peppery flavour to them. If this is your thing, then why not try growing mustard cress, mustard red giant, Mizuna and salad rocket. Of course, these are just ideas to start you off. If you already have a good idea of what salad leaves you like, then it makes sense to grow what you like to eat! You'll need to find a suitable container to sow your salad seeds in. Almost anything that can retain water will do - from a simple plastic window box to a recycled wooden wine case, old galvanised bucket or even a reclaimed ceramic sink! The size of container will of course depend on the amount of space you're able to allot, as well as how much salad you'd like to grow. If opting for wood, try to avoid anything that's been treated. It has been suggested that wood treatments can leach into the soil. Also bear in mind that metal may rust and crumble over time, so choose your salad box materials carefully. Also take into consideration that you may need a dish underneath the box to avoid any water spillages after watering! Once you've got your salad box ready, you'll need to get hold of a few materials. The bottom of your container will need a layer of broken crocks, polystyrene or gravel to aid drainage. You'll also need a good quality (preferably organic and peat free) compost. Make sure that the compost is crumbly and light, taking care to break up any lumps as you pour the compost into your container. Gently pat down the compost, firming it but not compacting too much. You'll then need to create a fine 'tilth' as a top layer. Tilth basically refers to the loose, fine top layer of soil - essential for allowing seeds to germinate and break through. You will then need to thinly sow your salad seeds. You can either scatter the seeds over the surface of the compost, or create rows by sowing in 'drills'. Drills are very shallow trenches where the seed is sown, before finely raking over or sprinkling a small amount of soil or compost to cover the seeds. Either way, you will need to prick out the weaker seedlings once they are around 2cm tall, as directed on your seed packet. Finally, you'll need to give your seeds a water with a watering can and fine rose. You'll need to water your salad box regularly, taking care not to allow it to dry out or become too waterlogged. Within around three or four weeks you should be able to start harvesting your salad. You can opt for 'cut and come again' varieties of salad, or simply keep sowing seeds in the vacant spaces as you pick your salad. This is known as successive planting and will provide you with a continuous supply of fresh salad leaves. TIP: If you find that your salad box is a veritable success, why not try expanding and growing trailing tomatoes, herbs and even mini cucumbers in containers?